Scleroderma (systemic sclerosis), Scleroderma or systemic sclerosis, is an autoimmune rheumatic disease. The word scleroderma comes from two Greek words: sclero meaning hard, and derma meaning skin. Skin hardening and tightening is one of the most visible manifestations of the disease. The disease is caused by overproduction and accumulation of collagen (a connective tissue) in the body that creates hardening (sclerosis) of the skin (derma) and internal organs such as the lungs, kidneys, heart and gastrointestinal tract. Unfortunately, not enough people in India know about this disease. Scleroderma varies in symptoms and severity from patient-to-patient. Most scleroderma patients may have symptoms that are visible, such as tight skin. Hardening of the skin is one of the most visible features of scleroderma. Scleroderma can progress more rapidly and aggressively. Knowing the early symptoms of scleroderma can help prevent the chance to permanent tissue or organ damage . Scleroderma is more common in adults. It is four times more common in women than in men. It is most common in young and middle-aged adults between the ages of 25 and 55 but can also affect children and the elderly. What are the types of Scleroderma (systemic sclerosis)? There are two types of systemic sclerosis, called limited cutaneous systemic sclerosis and diffuse systemic sclerosis. 1. 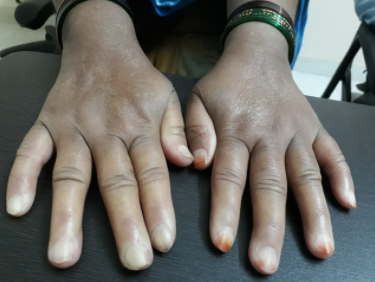 Limited cutaneous systemic sclerosis:A relatively less severe form that only causes thickening of the skin over the hands, feet and face, although it can eventually affect the lungs and digestive system too. It tends to get gradually worse over time, although it’s generally less severe than diffuse systemic sclerosis and can often be controlled with treatment. 2. Diffuse systemic sclerosis: is more likely to affect internal organs. Thickening of the skin affect the whole body. Symptoms come on suddenly and get worse quickly over the first few years, but then the condition normally settles and the skin may gradually improve. 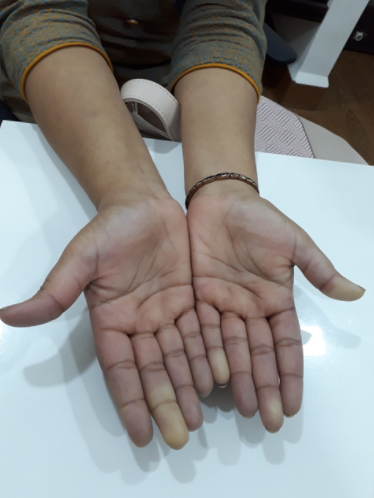 Raynaud’s phenomenon (exaggerated response to cold causing a circulation problem where fingers and toes turn white/blue in the cold) Thickening /tightening of the skin over the hands, feet and face, red spots on the skin, heartburn and problems swallowing (dysphagia). Severe tightening of facial skin can cause mouth to become smaller and narrower. Other symptoms can include weight loss, fatigue, joint pain, rashes, ulcers and muscle pain/weakness. In some cases of systemic sclerosis, organs such as the heart, lungs or kidneys are affected. This can cause a range of potentially serious problems, such as shortness of breath, high blood pressure and pulmonary hypertension (high blood pressure in the lungs). Scleroderma is an autoimmune disease leading to overproduction of collagen. A part of the immune system becomes overactive and out of control. The immune system mistakenly attacks the own connective tissue under the skin and around internal organs and blood vessels.This leads to cells in the connective tissue producing too much collagen, causing scarring and thickening (fibrosis) of the tissue. It’s not clear why this happens. If you have family member with scleroderma your risk of developing scleroderma is higher than the general population. You should see a rheumatologist if you have symptoms. The symptoms of scleroderma vary greatly for each person, and the effects can range from mild to life threatening.The severity depends on which parts of the body are affected, and to what extent in which they are affected. A mild case can become more serious if not properly treated. Early and proper diagnosis and treatment by qualified doctors may minimize scleroderma symptoms and prevent irreversible damage. Are people living with scleroderma at risk for any specific lung involvement? Lung involvement is an important predicting factor.It helps predict the survival rate of people living with scleroderma. Its important to be screened with an echocardiogram and pulmonary function tests. Lung disease is a leading cause of scleroderma-related deaths, and is a very common serious complication of the disease. Who should I see for scleroderma? A rheumatologist is an expert in this disease and should be consulted early in the course of the illness. There is no single diagnostic test for scleroderma.Conducting thorough medical history, examination and specific blood tests helps to make a diagnosis of scleroderma. What is the role of nutrition and dietary therapy? There is no scientific evidence that dietary restrictions are directly helpful in management of scleroderma.Sour foods like lemons, tomatoes and vegetables like brinjal are very important sources of essential nutrients.Joints and muscles can become weaker due to malnutrition which even makes difficult to treat their scleroderma.A well-balanced diet helps people manage their body weight and stay healthy. Can alternative therapy cure my scleroderma? Some people claim to have been cured by treatment with herbs, oils, special diets or exercise alone.However, there is no scientific evidence that such treatments cure scleroderma. Importantly, these unregulated treatment modalities may cause serious side effects. Also, delayed treatment can cause irreversible damage. With recent advances in management of scleroderma there are a variety of treatments options available. A rheumatologist is an expert in this disease and should be consulted early in the course of the illness.Therapies used by the rheumatologist can slow the disease progression.Some people can go off treatment when their scleroderma is not active.Because there is so much variation from one person to the next, treatments vary for each patient. It is a misconception that allopathy doctors only prescribe steroids and painkillers.Rheumatologists prescribe disease-modifying medications to help with symptoms and stop progression of disease. Newer therapies (Biologics) used by the rheumatologist can slow and in many cases stop the disease progression.